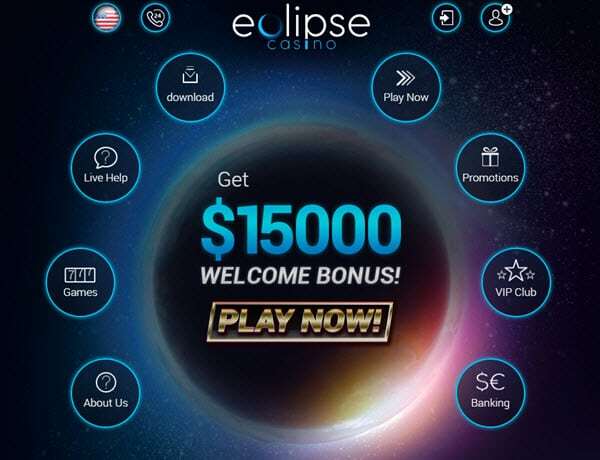 Eclipse Casino no deposit bonus 2019 - Get $15 Free NOW ! Upon first glance at Eclipse Casino's home page, you might think you have discovered a website that is going to be different than the average gambling establishment. The design is definitely unique. Instead of browsing an upper bar with tabs for each of the different landing pages, you navigate what appears to be floating circles. As you begin to look over the site, you can see that the rest of its design delivers the standard dark colors, block-design set up, and navigation bars that have become so familiar with online casinos. Games, promos, and banking at Eclipse Casino are similar to what you might find elsewhere, With a Curacao-provided license, this casino delivers its authenticity as a legitimate gambling establishment. It taps into the power provided by Rival, a popular software giant, to deliver hundreds of familiar titles offering seamless game play that avoids choppy transitions or stoppages in play. eclipse Casino play now ! Eclipse Casino wants you to keep coming back and has advanced security measures on its site to ensure that you do. Top-of-the-line Secure Socket Layer (SSL) technology is in place to protect the personal and financial data of members for all transactions. Every deposit and withdrawal request is encrypted, keeping your information hidden from prying eyes. On a side note, make sure that you log out whenever you stop game play, because the site does not automatically log you out when you go idle. If you are using a public computer or one that is shared with other family members of friends, you risk having someone access your account unless you log out each time you are finished playing. Depending on the casino software you are using when first signing up, the process can be simple or complicated. If you download Eclipse Casino, the tab for signing up is readily visible. On the other hand, if you opt to load the site in your web browser, you may find yourself hunting around for the “Log in” or “Sign Up” tab. Eventually, you will find it, but it does take some sleuthing as you need to first click on “Play for Real”. Once you get to the registration form, you need to fill in more information than you do on other sites. Since you'll need to submit all of that information to deposit and withdraw funds, you might as well provide those details when you first join. If you are looking for large winnings and powerful backing for wagering try the $3000 Welcome Bonus for Slots. “ECLIPSE300” is the code you need to enter to gain access to a 300% bonus delivered across your initial three deposits. It is playable on slots only. If cards is your specialty, the $1500 Welcome Bonus for Cards offers an excellent option. You earn a 150% bonus on your initial three deposit transactions for a total of $1500 in match deposits. Just use the code “VEIL150” when you accept your membership at the Eclipse Casino. The fun doesn't stop after your initial bonus. Each month, a new offer is always available for members looking to enjoy a few hands of cards or a game of slots. Only a few methods are supported for depositing and withdrawing funds, creating an issue for some players. A minimum deposit of $25 is required with all methods, which include bank wire, Skrill, Visa, MasterCard, Neteller and Paysafecard. Each of these methods is capped at $1000, except for bank wires, which allow for unlimited deposit amounts. Eclipse Casino prefers Visa and MasterCard for deposits but won't make much of a fuss if you try to use one of the other ones. All withdrawals must go through an approval process, which is part of why withdrawing your money takes so long – up to seven days. Withdrawal methods include bank wire, Skrill, Visa credit, MasterCard credit, and Neteller. Unlike many other online casinos, the number of member restrictions for joining appears to be relatively small. Players from Canada, Ukraine, Israel, and Belarus cannot join. Even if you manage to sign up from one of those locations, it won't do you any good because you won't be able to collect any winnings once you are found out. US members can enjoy toll-free phone, mail ([email protected]), calling to get answers to their questions. If you have an issue that needs immediate attention, you can use live chat to get a quick response.